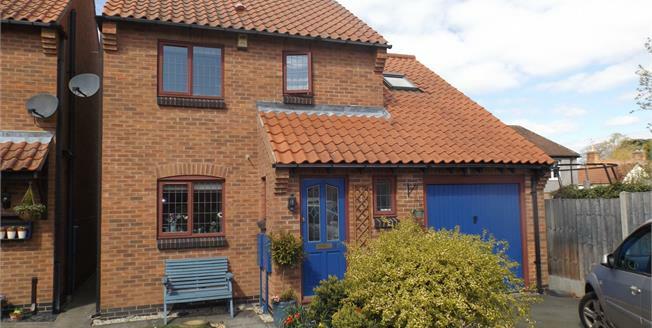 A well presented detached home in a superb village location being offered with no upward chain. Accommodation briefly comprises of entrance hallway, kitchen, cloak room, lounge diner and study to the ground floor. To the first floor there are three bedrooms, a family bathroom and an en suite shower room. Outside of the property are lovely established gardens, driveway and single garage. Double glazed obscured window to the front aspect, heated towel rail, tiled flooring, low level W.C and vanity hand wash basin. Double glazed light leaded window to the front aspect, a combination of wall and base fitted units with roll edge work surfaces, inset stainless steel bowl sink and drainer unit, tiled splash backs, space for washing machine, integrated fridge freezer, gas hob, electric oven and extractor hood. A spacious room with patio doors leading onto the rear garden, laminate flooring, TV point, two radiators and contemporary electric fireplace with marble effect surround and double doors through to study. A versatile space currently used as a home art room / study, having a double glazed window to the rear aspect, radiator and laminate flooring. Having an up and over garage door to the front, power and light. Giving the access to roof void and doors to first floor accommodation. Double glazed bow window to the rear aspect, radiator and door to en suite. Double glazed obscured window to the rear aspect, heated towel rail, low level W.C, vanity hand wash basin, shower in cubicle, shaving point, extractor fan and tiled splash backs. Velux ceiling window to the front aspect, double glazed window to the rear and radiator. Double glazed obscured window to the front aspect, panelled bath, low level W.C, pedestal hand wash, radiator, shaving point, tiled splash backs and door to airing cupboard with cylinder, boiler and storage space. A pretty established garden with driveway leading to garage and gated side access to rear garden. A delightful rear garden offering a good level of privacy, having a good sized patio seating area, lawn, garden shed, fenced and walled boundaries and established planted borders.